I have always been a book lover, for as long as I can remember, even as a toddler. I didn't have a "best friend" till my early teens. Never really needed one either. I always had books to give me company. Every time Dad visited Patna from Kanpur (when we used to stay in Kanpur), he used to get a bunch of books for me as gift. I loved those gifts. And I remember a distant relative from my mother's side once sent me a collection of four pocket-size novels. They were abridged versions of some very famous English classics like Great Expectations and Around the World in 80 Days. I was about 9 years old at that time, and totally thrilled. At an even younger age, somebody gave me a set of fairy tales, like Snow White, Hansel and Gratel etc. That set had more pictures than text... very pretty pictures. I had that set in my collection for a very long time too. In those days, traveling by train was looked forward to for many reasons, one of them being that I always got at least a couple of new books from those A.H. Wheeler stands at the railway stations. And when my grandfather (mom's father) had his open heart surgery in Chennai long long ago, both my sister and I got a mammoth collection each, of children stories. Two extremely large, hard-bound, beautifully illustrated books, with such glossy pages! My sister wasn't that obsessed with books (as in she didn't eat, sleep, dream them... just read them once and that was all!)... so for all practical purposes, both the books went into my collection! I think I was on seventh heaven for a very long time after that! Actually, some of my school friends might remember... I had all my books properly cataloged back then! I maintained a file (like our project files you know), having a separate page for each author/series (Sidney Sheldon, Nancy Drew, Jeffrey Archer, Enid Blyton, Hardy Boys, Perry Mason, P.G. Wodehouse, and so many others). Odd books were clubbed under "Miscellaneous". And those of my classmates who borrowed books regularly from me, they had their own individual page too in that file, in which I used to make a note of the date of borrowing, name of the book, and the date of returning etc. Like a proper library, yeah! Life used to be blissful back then. But several relocations and lack of enough space forced us to part with our awesome collection of books, both mine as well as my Dad's (which, obviously, would have been bequeathed to me eventually). I now have a very few books of fiction left with me -- the Harry Potter series, the LOTR series, the Twilight Saga series, and some other random new purchases. I have a whole lot of Mills & Boons got on rent from somewhere years ago, but they've still not been read! And I have some Wilbur Smiths borrowed from my uncle, again unread, because they happen to be part of a series -- the *ending* part of the series! I have a lot of books related to Reiki etc. now, and most of my computer books that we didn't throw away. Nevertheless, my entire collection now is not even half of what it used to be earlier. 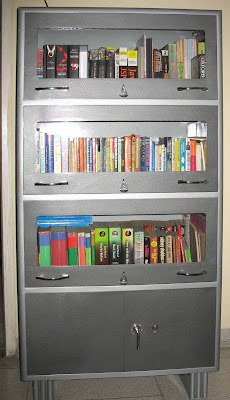 Anyway, I recently bought a book almirah for storing all my books. We really needed to free all those odd places in our several cupboards and Dad's "office desk" where these books had been "stowed away" lately! Besides, I was kind of losing track of where I'd "packed" a particular book, and the regular "book hunts" were driving me nuts! So here's a picture of my new book almirah. Managed to dig out all my books from their various "hiding places" throughout the house... and arranged them in my new book almirah yesterday. "Lost" my LOTR series for several agonizing minutes, but it was eventually discovered behind a pile of clothes in the top shelf of my sister's old almirah! P.S. - Isn't it fun revisiting your childhood through these timeless books of those days gone by? Your story is so very similar to mine! Unlike other girls who would buy every doll and Barbie possible, I would go with my father to the market and buy books!! I remember, my very first book that I read on my own was the 'Aesop's Fables' - It was a mammoth book with lovely illustrations... sadly, it got lost when we were shifting to a new city. But, seriously, books and music too [who doesn't love music] are great company! I can totally get lost in a book and withdraw from my surroundings - to all those wonderful or horrific places, depending on the genre of the book. 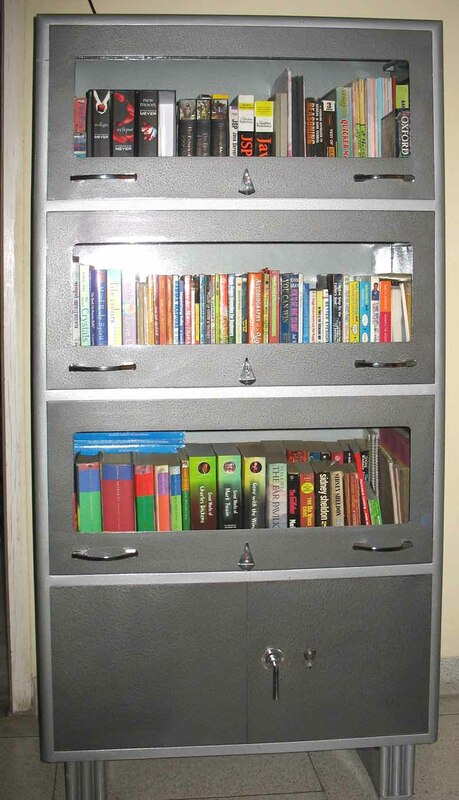 Lovely post and, super-nice Book Case/Cupboard/Almirah :) Cheers!! -- Venice. @ Rachit: I recently re-read Around the World in 80 Days too... but that was in ebook. Don't have a print version of it anymore. Oh yes Venice! Dolls were such a waste of money when you could get books for that money instead! And it seems like relocation and books just don't go well with each other! And you remember that line from Reid & Taylor Ad?... "Books are a machine for time travel." One of my favorite quotes. And isn't it true? Well it is actually a very standard model, available in most steel furniture shops. Available color combinations are more now though.